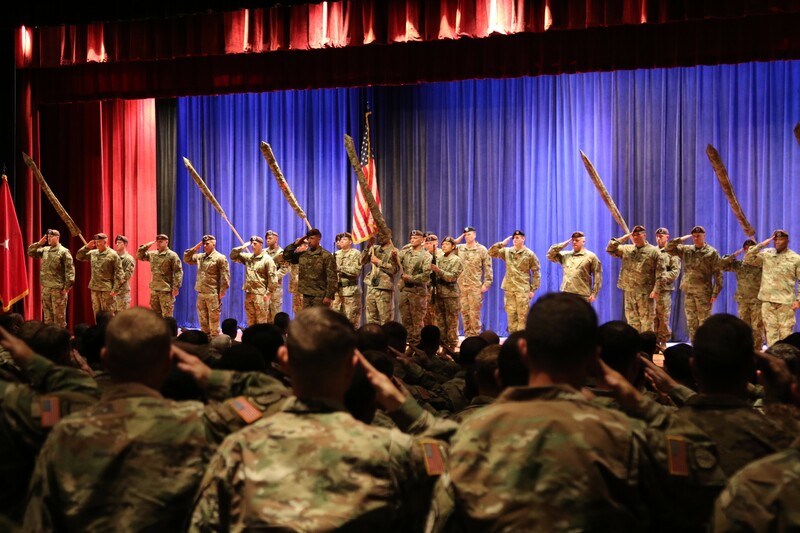 The 1st Security Force Assistance Brigade (SFAB) officially marked its return from a 9-month Afghanistan deployment with a colors uncasing ceremony at Fort Benning, Ga. on Dec. 3. 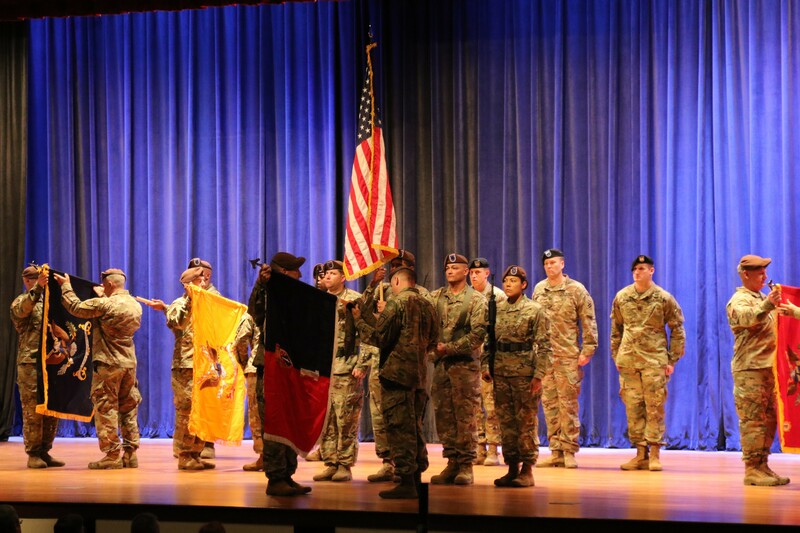 The event acknowledges the unit's return from supporting the Afghan National Defense and Security Forces. During their deployment, the 1st SFAB Advisors were located throughout Afghanistan conducting train, advise, assist, enable and accompany operations for the NATO Resolute Support Mission's Train, Advise, Assist Commands and Task Forces. While addressing the audience at Marshall Auditorium, Brig. Gen. Scott Jackson, 1st SFAB commander, directly addressed his 1st SFAB Advisors about their impact during the deployment. "The natural question that comes after any combat deployment is 'did I make a difference'," said Jackson. "I will tell you, looking across the entire theater the last nine months, the answer is yes." The 1st SFAB activated on Aug. 16, 2017 and deployed last February as the first of six specialized brigades with the mission to conduct train, advise, assist, enable and accompany operations with allied and partner nations effectively establishing the way forward for future SFABs. "When we departed in November we validated this unit's capability and we have shown the Army that it is mission-essential in Afghanistan," said Jackson. During his speech, Brig. Gen. Mark H. Landes, Security Force Assistance Command commanding general, explained, that without a set of rules no team would be effective and congratulated 1st SFAB the Advisors for establishing the rules for future SFAB deployments. "What the 1st SFAB has done, over the course of this deployment and prior train-up, is establish a set of rules that the rest of us can follow," said Landes. "That is hard, tireless work and I couldn't be more proud of you and in the professionalism you showed in establishing these rules." In addition to 1st SFABs return, Soldiers from 1st Battalion, 28th Infantry Regiment, 3rd Infantry Division "Black Lions", also returned. The Black Lions served as their security force element allowing the 1st SFAB Advisors focus on their partners while keeping both them and their Afghan partners safe. The 1st SFAB conducted an extensive training program to prepare for its deployment. The training included the Military Advisor Training Academy (MATA) and culminated with a unique security force assistance-focused mission readiness exercise at the Joint Readiness Training Center at Fort Polk. Created by Gen. Mark A. Milley, Army Chief of Staff, when he envisioned new type of organization with specially-trained formations built to enable combatant commanders to accomplish theater security objectives and enable offensive operations in multiple units simultaneously. There are currently five active duty SFABs and one Army National Guard SFAB being established for this mission.